Saturday nights: you never know what might happen. And last night, up at Polteggan Farm Heamoor, things were definitely getting lively. Mr Semmens called the fire brigade out from Penzance just as darkness was falling. 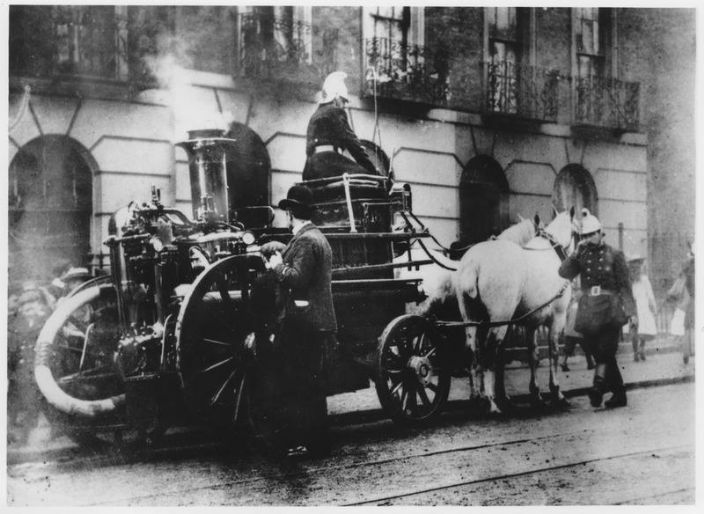 In no time Captain Nicholas and his crew set off into the night with their steam apparatus - “rattling, in Metropolitan style, through the streets to the scene of the fire, followed by an immense crowd on foot and awheel”. Steam fire engine - the steam boiler provides the pressure for the hose while the engine is propelled by the horses. And so the “smart little engine” arrived, “at full gallop”, with its retinue puffing up the road behind. But what did all those Saturday night thrill-seekers find when they arrived? Perhaps not the sensation they were hoping for after their walk, or uphill ride. Just a hay rick blazing merrily away. Sizeable, mind – 16 tons. Hay only gathered in last week. Well, Captain Nicholas and his men were lucky. No breeze, so no danger to the farmbuildings, and half the hay saved. But things could have been different – very different. Water was the problem. Plenty of locals all too ready with their advice: impossible turns, dashes up and down the lane, and a so-called reservoir that turned out to offer “more dirt than water”. There was a bit of a to-do in a cabbage field, which ended with the gate firmly shut, the engine trapped inside and the owner ranting about compensation for his own damaged crop before there was any question of the hay rick being attended to. And then, with the fire still blazing away, the men tried valiantly to dam a stream. At one point the boiler, with 100 lb of steam pressure inside, was wedged against a rock. Captain Nicholas, after dashing from pillar to post, decided he’d had “about as much help locally as he cared to accept”. He turned a deaf ear to further bright ideas from the folk of Heamoor, and resolved to use a more reliable source - the town reservoir, a full quarter mile away. All night they fought the blaze, “cutting, pulling, opening out, wetting down” with “hayknife, pikes, rakes, and hoses”, and it wasn’t until dawn this morning that the flames were under control. No thanks to Heamoor folk. Except for one doughty worker, Mr Trewhella, they all just stood and gawped as the firemen shifted the hay. Not so much as a cup of coffee offered to the men when, in the full light of this summer morning, the blaze was finally out. As they trudged home, the brigademen will have reflected on their night’s service as “the most miserable experience they had ever met with”. “Seeing how capricious the local aid proved in this instance, would it not be desirable that opportunity be given our fire officers to make themselves acquainted practically with all the properties, and their available water supplies round the district? Much valuable time might then be saved, and a few minutes gained at the start would probably be worth a few hours later”.